Is modern preterism a revival of the Hymenaean Heresy? We are thrilled to introduce to our visitors a new author that we hope to see more of in the near future. His name is Holger Neubaur. Holger and his wife Gloria work with the church of Christ at Lakeshore in South Haven, Michigan. They share five sons. Holger received his B.A., with Tennessee Bible College and his M.A., from International College of the Bible. Holger has been involved in 8 public debates and has recently embraced realized eschatology. Below is an article by Holger responding to the charge that preterism is a revival of the on the Hymenaean Heresy. Those who reject the clear time statements for the resurrection often cite 2 Timothy 2:17,18 as an alleged proof text that the resurrection is still yet future. But this passage teaches no such thing. The scripture posits the resurrection at the fall of Jerusalem and ample proof will be supplied in this article. Hymenaeus and Philetus taught the “resurrection is past already”(2 Timothy 2:18), because they would not honor God’s own time statements and argued that the Jewish system was to continue. Hymenaean Heresy: How Is This Possible? First, if the common belief of the early church was that the resurrection was to take place at the end of physical universe, then how could have Hymenaeus and Philetus influenced anyone at all? They would have been viewed as crackpots that had lost their minds and no one would have taken them seriously. Paul would not have wasted the precious words of inspiration on such nonsensical false teachers. But if they were saying that the resurrection was past while Jerusalem was still standing they would have been teaching the same thing as the Judaizing false teachers, which taught the law and temple would remain. The false prophets of 2 Peter 3:4 were of this ilk, which said, “all things continue as they were from the beginning of the creation” which contradicted Peter’s own words, that “the end of all things was at hand”(1 Peter 4:7). The Jewish age was to come to an abrupt end with the destruction of its temple and law (Matthew 24:3,34; Daniel 9:24-27). 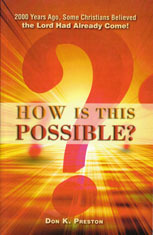 See Don K. Preston’s book: How Is This Possible for an even deeper investigation of this point. It really is the epitome of illogic to believe that Hymenaeaus could convince anyone that the end of time, the raising of every dead corpse in the ground, and the destruction of the universe had taken place yesterday….or at any point in the past! How could anyone, convince anyone, that the universe was destroyed and time had ended? Second, Hymaneaus and Philetus could have influenced the early church only if the disciples believed that the resurrection was to take place in the very generation that they lived in. Jesus said, “the men of Ninevah shall rise in judgment with this generation” (Matthew 12:41). Jesus was referring to that particular generation that was then living. When Martha said of Lazarus, “I know that he shall rise again in the resurrection at the last day” (John 11:24) she was referencing the Jewish age and not the Christian age. Martha was a Jew and lived in the Jewish age. She knew that Daniel was to, “stand in his lot at then end of the days”(Daniel 12:13). Daniel was referencing the end as it was attached to the “abomination of desolation,” a clear reference to end of the temple and the daily sacrifice (Daniel 12:11;Matthew 24:15). The Jews knew that resurrection would take place at the end of their age, not at the end of another distant age. Third, the only time there is specific mention of a resurrection of both the just and unjust in the Old Testament is found in Daniel 12:2, which says, “And many of them that sleep in the dust of the earth shall awake, some to everlasting life, and some to shame and everlasting contempt.” Daniel tells us that this resurrection would take place at “the time of trouble, such as never was since there was a nation even to that same time” (Daniel 12:1). This time reference is the time of the great tribulation where Jesus said, “For then there shall be great tribulation, such as was not since the beginning of the world to this time, no, nor ever shall be”(Matthew 24:21). Therefore, the resurrection was to take place at the time of the great tribulation. When Paul argued his case before Felix, he averred that he believed “all things which are written in the law and the prophets: and hope toward God, which THEY(the Jews) also allow, that there shall be a resurrection of the just and the unjust”(Acts 24:14,15). Paul said that he was “bound for the hope of Israel” (Acts 28:20). There is no Christian hope that is not fulfilled in Israel’s hope. Paul was quoting from Daniel’s prophecy because he argued that the Jews had the same hope. The Jews were not trusting the words of Jesus! Neither did they learn about resurrection from Jesus. Where did the Jews get their hope of resurrection? They received their doctrine of resurrection of the just and unjust in the only place in the Old Testament that there is a specific mention of it (Daniel 12:2). Too, Daniel cannot be speaking of a resurrection of a cause, because the unjust are resurrected at the same time. Neither can he be speaking of the resurrection of the saints in Matthew 27:52 for the resurrection of Daniel 12:2 was to take place at the time of the great tribulation, which would take place forty years later. Fourth, it is actually the futurist traditional view that is guilty of Hymenaeun heresy. You see, the false teachers would not allow the words of scripture to be consistently applied. Resurrection was to take place at the time Jerusalem fell. The resurrection out of the Hadean world took place at the end of the Jewish age. In Revelation 1:18 we find Jesus had the keys to “death and hell.” Hell here is the word Hades. Jesus came to destroy spiritual death and the Hadean world. Read Revelation 11 carefully and you will discover that the “time of the dead, that they should be judged and that thou shouldest give reward unto thy servants the prophets” took place when Jerusalem fell (Revelation 11:1-18). It was at this time that the kingdoms of men would become the kingdoms of our Lord (Revelation 11:15; Luke 21:31,32). Therefore, any interpretation of scripture which would place the resurrection 2000 years after the fall of Jerusalem (and waiting) is a false interpretation of scripture. Fifth, the resurrection is missed because of the same prejudice that rejected Jesus in the first place. Jesus was rejected by the Jews because they were looking for a physical king who would punish their physical enemies (John 6:15). The premillenialists miss the kingdom because they are looking for a physical kingdom where the lion would lay down in a physical way with the lamb (Isaiah 11:6,7). The futurist position misses the resurrection because they tie it to the physical, when Israel’s hope was not physical at all. The death spoken of in the Old Testament was spiritual, not physical (Isaiah 25:8; Hosea 13:14). These are the very texts that Paul quotes in 1 Corinthians 15:54,55, where death is swallowed up in victory. The sting of death of 1 Corinthians 15:56 is not the sting of physical dying, for physical death is the friend of a Christian (Philippians 1:21-23). The sting here is the sting of losing relationship with God. The strength of sin is not the gospel for “letter killeth but the spirit giveth life” (2 Corinthians 3:6). The law was done away by means of the cross, not at the cross. The law was “ready to vanish away” at the time Hebrews 8:13 and 10:1 were written. Every Jew who rejected Christ were judged by that very law (Deuteronomy 18:15-18; Acts 13:40,41) that they claimed freed them. Christ was the end of the law for those who believed (Romans 10:4). Hymenaeun heresy is alive and well. But not with those who hold to the spiritual concept, but with those looking for a physical resurrection. Jesus said, “he that liveth and believeth in me shall never die”(John 11:26). Note from Don K. Preston: Be sure go get a copy of my MP3 series on The Hymenaean Heresy: Reverse the Charges!” This series goes in-depth in responding to this charge and has one of the most extensive exegetical examinations of 2 Timothy 2:18 to be found anywhere. Wonderful article, and I would like to invite Holger Neubaur to be a columnist with The Fulfilled Covenant Magazine. Yes, thank you so much for this article and for not merely defending the preterist viewpoint but being bold enough to attack the heresy of futurism, which I believe has done great harm to the Body of Christ. I have been so confused about the end times for so many years because of teachers that misinterpreted the Scriptures by placing their fulfillment into the future where they did not belong. Truth does matter and rightly interpreting God’s word is essential. Thanks again! I enjoyed the article! The Bible CANNOT be spiritualized in every single place as you nuts like to do, because then the Bible would be very inconsistent. The prophecies about Christ’s death, burial and resurrection were fulfilled physically and literally, and you lunatics will not stop the Bible’s prophecies of the future resurrection and coming of Christ from happening literally just because you are poor students of the word of God. Preterism is a joke and so is this website. Mr. Beck, I have deleted several of your posts due to your abusive language and attitude. If you cannot conduct yourself honorably and communicate with respect, you will not be allowed to post on this blog. Your presuppositional theology has blinded you to how the NT writers – inspired by the Holy Spirit – interpreted the Old Covenant promises. Your logic fails when you say that because some prophecies were fulfilled literally that means all prophecy had to be- or has to be – fulfilled literally. Isaiah said that “The Voice” would level every mountain, and fill every valley. John the Baptizer was the fulfillment of that prophecy, (Mark 1:1-3)– but, can you show me where John did any “literal landscaping of mountains and valleys? No, you can’t. The language is clearly not “physically literal” as you insist that prophecy must fulfill. Now, let me say again, that if you cannot engage in dialogue with decency, respect and decorum, you will not be allowed to post. Your attitude is a violation of 2 Timothy 2:24. Previous Previous post: Bible Hermeneutics| Do Preterists Spiritualize Scripture?